Smith’s plan took a huge hit in the second game of the season, the home opener against Furman on November 14, when defending Ivy League scoring champion Noruwa Agho ’12 suffered an injured left knee. He is expected to miss much, if not all, of the remainder of the season. “We’re planning on not having him anytime in the near future, or the late future,” Smith told Spectator. Agho had been expected to team with fellow guard Brian Barbour ’13, the team’s top two in scoring, assists and steals last season, and center Mark Cisco ’13, who showed flashes of talent while battling a string of injuries and illness last year, to form the core of this year’s Lions. Without Agho, it will be up to Barbour and Cisco to provide the nucleus if Columbia is to improve on the 15–13 record it posted in Smith’s debut season, including an impressive 10–4 at home. Columbia was 6–8 in Ivy play and tied for fifth place in the league. The Lions, whose 70.8 ppg last season were the most for a Columbia team in 18 years, will begin the Ivy League portion of their schedule on Friday, January 13, by hosting Penn. Barbour emerged as a starter last season and averaged 13.3 points and 3.2 assists per game. 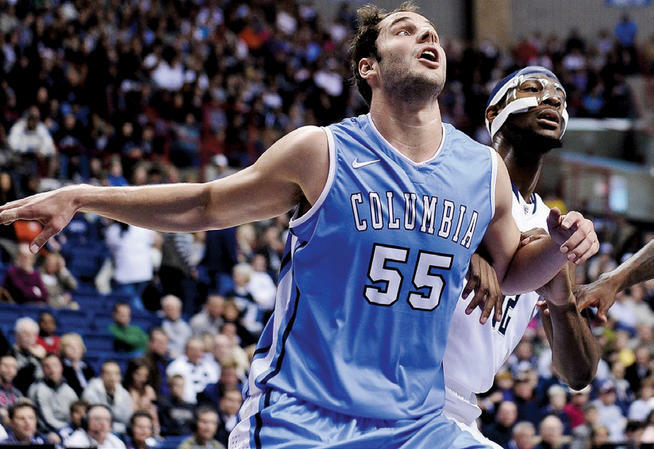 But with the departure of last season’s leading rebounder, Asenso Ampim ’11, and 7-footers Max Craig ’11 and Zack Crimmins ’11, a key to Columbia’s success could be the play of Cisco, a 6-foot-9, 245-pounder who was hampered last season by appendicitis, a knee injury and a concussion. Despite being limited to 17.1 minutes per game, he averaged 6.8 ppg and 4.6 rebounds per game. As for the Ivies, Smith downplayed the preseason media poll in which the Lions were picked to finish seventh, saying, “You could throw a blanket over teams 2 through 7, they’re really that close.” The team everyone will be chasing is expected to be Harvard, last year’s co-champion, which received 16 of 17 first-place votes from the media panel. FALL ROUNDUP: Football coach Norries Wilson was relieved of his duties after the Lions completed a 1–9 season, one in which the Lions came close to winning several times before finally beating Brown in double overtime 35–28 in the season finale. In six seasons, Wilson’s teams compiled a 17–43 record. Highlighting the fall season, Columbia’s men’s soccer team finished just one point away from the Ivy championship. After Brown and Dartmouth had battled to a scoreless draw on the final day of the season, Columbia needed a win over Cornell to leapfrog both and capture the crown, but could only manage a 1–1 tie at Ithaca on November 12. Columbia finished 8–7–2 overall and 4–2–1 in Ivy play, its best league record since 2002, but one point behind Brown and Dartmouth, who were 4–1–2. Volleyball and field hockey both enjoyed winning seasons. Volleyball was 15–10 overall and 9–5 in the league, while field hockey finished 9–8 overall and 5–2 in Ivy play, missing the league title by just one game. Women’s soccer did not fare as well, going 6–10–1 overall and 3–3–1 in the league. The men’s and women’s cross country teams fared well, both finishing second in the Ivy League Heptagonal Championships and placing third and fourth, respectively, at the NCAA Northeast Regionals. COACH JONES: Joe Jones, who coached Columbia’s men’s basketball team from 2003–10 and spent last year as the associate head coach at Boston College, is now the head coach at Boston University. Jones inherited a Columbia team that went 2–25 and was winless in Ivy play in 2002–03 and built it to respectability, compiling an 86–108 record in seven seasons as the Lions’ head coach. RUGBY @ 50: The men’s rugby club held a reunion to celebrate the 50th anniversary of its founding as well as the women’s rugby club’s 20th. A three-day event, it commenced with a reception on April 15 at the Dodge Fitness Center where club president Thomas Timberlake ’12, captain Derek Lipscomb ’11 and women’s captain-president Juliette Conte ’12 introduced their teammates to about 50 attending alumni, including Friends of Columbia Rugby Alumni Board members Brian Murphy ’84, Lewis Fischbein ’72, Richard Coppo ’69 and Richard Luthmann ’01. Among others in attendance were John Sidtis ’73; Bradford Higgins ’74, ’78L; James O’Donnell ’74; Dr. Luke Vaughan ’76; Dr. Peter Beller ’77; Christopher Sheridan ’90 GS; Peter Hatch ’92; Stuart Dearnley ’01; Mathew Hughes ’01, ’07 Business; Ikenna Ibe ’01E; Jeremy Mangion ’01E; Christopher Miller ’01, ’08 GSAS; Dr. Daniel Wetmore ’01; Nicholas Elkins ’02; Augustin Llona ’02; Michele Connolly ’01; Jessica Grodstein-Kennedy ’01; Becca Parks ’01 Barnard; and Rebecca Brafman ’04. A match was played the next evening against Yale RFC at the soccer stadium to commemorate club founders John Wellington ’57; Patrick Moran ’63, ’64 Business; William Smith ’57; and Bill Campbell ’62, ’64 TC in a reprise of their initial match at the old Squadron A Armory a half-century earlier. As in their inaugural encounter, Columbia emerged the victor. Heavy rains could not dampen spirits as the Old Blue RFC, the club’s alumni benefactors, hosted a post-match barbecue in the shelter of Wien Stadium. The weekend concluded on a sunny Sunday with the traditional social match between the club and its alumni.